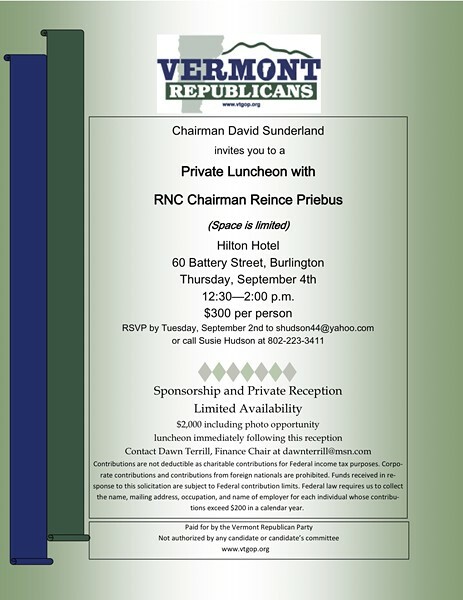 Roughly 30 Vermont Republicans shelled out at least $300 each to talk strategy during a chicken luncheon with the Republican National Committee chairman, Reince Priebus. The conversation was not for public consumption. 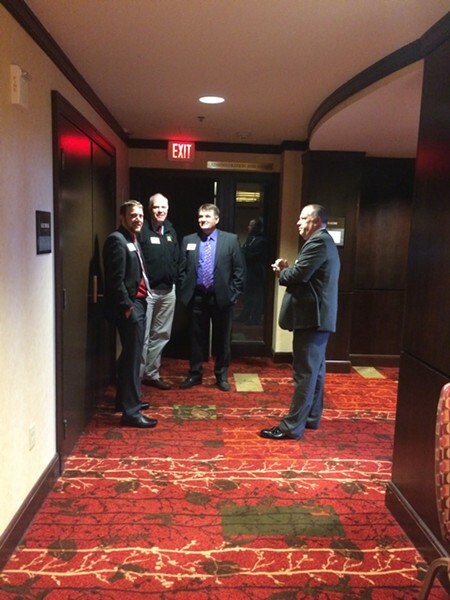 Held Thursday at the Hilton Hotel in Burlington, the lunch was an invitation-only affair. Left off the guest list? The press corps. Seven Days obtained a copy of an invite sent out by David Sunderland, chairman of the Vermont Republican Party, and showed up to the event, but Sunderland did not allow the reporter to enter the room. "Don't take it personally," he said. "It’s a private event for individual supporters of the party, and we wanted to be able to have open and frank discussions with our supporters as well as chairman Priebus, and we thought that would be better served in a private environment." Who made that call — Priebus or the Vermont party? "It’s a good question," Sunderland said. "I need to refresh my memory and think if that was requested by them or by us. I don’t think that it was ever, I don’t want to misstate something. I guess you could say that the Vermont GOP decided it would be closed." It's not the first time Republicans have opted for a press-free event. Their last closed-door affair — or at least the last one that reporters found out about — took place in December, when New Jersey Governor Chris Christie came to town. Republicans aren't alone in such decisions, Sunderland was eager to point out. He recalled a Democratic event that took place in 2011 and featured the first lady, Michelle Obama. One local reporter was let in. "These events are routinely closed to the press," Sunderland said. The state's second- and third-highest ranking Republicans, Sen. Joe Benning (R-Caledonia) and Rep. Don Turner (R-Milton), greeted guests at the door. Among those attending: Scott Milne, who, fresh off his Republican primary victory, is now challenging Gov. Peter Shumlin in the general election. Republicans stand outside the luncheon, including Vermont Republican Party campaign director Jeff Bartley (far left), Sen. Joe Benning and Rep. Don Turner. Did he think reporters should be allowed in? If he were holding the event would he let them in? So what types of top-secret topics might Vermont Republicans discuss with Priebus? "It's generally an informal gathering. I think supporters of Vermont Republicans are interested in hearing the chairman’s perspective on the prospects for Republicans on a national level and what his plans are for the national party going forward," Sunderland said. What about cash for a beleaguered branch of the national party that's operating in a very blue state? That could come up, Sunderland said, but "that’s not the main focus of his visit here." The party doesn't have specific fundraising goal for Thursday's lunch, according to Sunderland. Besides the $300 lunch, people could pay $2,000 for a photo op with Priebus. Does the two grand get them any additional perks? "No, some vegetables," Sunderland deadpanned. "Some dip."